A Few First Steps: A month! A month. A month? A month since I’ve blogged. And I’m honestly trying to think of what this whole month consisted of that made me too busy. I’m not really sure. It is a blur of bath time and nap time and bedtime and dinner time. Story time and play time, let’s go time, and go home time. There was a trip to the mountains and a trip to the farm, explanations about why clouds follow our car. Why the moon follows our car. Why we should not look directly at the sun. My baby girl turned one. Guy outgrew his shoes, jeans and blankie this month. Joey grew into slamming his door, eating ice cream fast enough for an ice cream headache, and into two new pairs of pants. We took our dog to get groomed. We tuned the guitar and taught the boys new old songs that I only seem to remember lines and not verses from. The topic of heaven came up for the first time. Joey spells his name. The boys function on a completely different idea of time then I do. 2 year old Guy’s version of both ‘yesterday’ and ‘last time’ is “lasterday.” Joey tells me he will be big like daddy soon. “Tomorrow” He says nodding his head. A clock means nothing to them, except amusement as they sit and watch the hands turn. A digital clock is only a puzzle. A six looks like a b to them and a five looks like an s. It is surely anyone’s guess what time it is if you ask them. And it doesn’t really matter. Ask Joey what time it is and he knows for sure. “Snack time.” He will always answer. Confidently. Instead of our time neatly in an hour glass it seems to me that our sand time has snuck into Guy’s shoe at the playground. And we get home and he takes off his socks and empties it all over our carpet. And it’s just a little bit of sand and a little bit of an afternoon. And already running, he is on to the next thing. And I hardly have time to even take notice of the day until everyone is in bed -breathing and sleeping. I tuck them in and pick up the dishes and pick up their clothes and pick up their little socks. But again, I am re-purposing to try and write about these times. To try and remember these days. 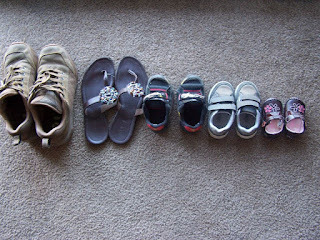 Then line up their shoes for tomorrow. can't believe it's already been a month- goes by so fast!